While leather products are some of the most durable ones you can make, they are also some of the most difficult. But If you’re like me and want to make leather crafts at home, standard sewing machine might not do the trick. If you don’t have a good leather sewing machine, you’ll find it difficult to work with it and potentially ruin a very expensive piece of material. So that’s why we have made this handy guide to help you make the decision that might make sewing leather that much easier for you! 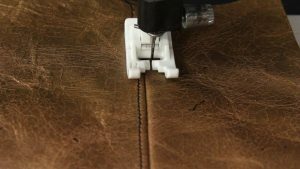 Why do you need a leather sewing machine? If you’ve ever worked with leather, you know that you CANT make mistakes. Leather is unforgiving in this aspect because all it takes to ruin this expensive material is one stitch in the wrong direction. That’s right, one mistake can ruin the material because, unlike with other fabrics, if you make a hole in leather, it’s there forever. Because of this, you should not use pins to plot the project as they will leave permanent holes in your leather piece. What makes sewing leather even more difficult is that it tends to stick to parts of the machine. You’ll often find that leather sticks to the presser foot or the throat plate if you don’t have the proper sewing machine for the job which you can get around by putting some masking tape on the parts, but then the material might be too thick for the sewing machine. Same rules apply when sewing faux leather and similar materials. If you want to test your sewing machine to see if it works with leather, just take a small scrap of the material you want to use and see how your sewing machine behaves. If it wobbles, gets stuck or is just plain not taking the thickness of the leather, it might be time for you to upgrade to a sewing machine that’s made to sew leather. What Are the Basics of Leather Sewing? There are a whole bunch of rules you should live by when sewing leather and we are going to get into some of them here. First of all, if you’re sewing leather, you’re going to want to watch your thread tension carefully. Standard sewing machines will often times break the thread because they automatically try to stitch tighter and doing that with leather might cause the thread to break. You will also want a very sharp needle ALL the time. Leather will dull and ruin the point of the needle much faster than with other fabrics. Not changing the needle will cause it to break which in turn can jam your machine AND ruin your material or project. You will want to change needles consistently when working with Leather. When it comes to the thread itself, you’re looking for something stronger than traditional cotton thread. Most popular options are synthetic threads like Nylon, polyester, and rayon. Should you go for an Industrial grade sewing machine? Short answer – no. And here’s why. When it comes to industrial sewing machines, you’ll have a whole bunch of additional variables and problems to worry about. For example, you will need to oil it consistently (unless you buy a sewing machine that’s worth more than your car) and the price you’d pay for it is just not worth it if you need a sewing machine for light home projects. If , by chance, you need to sew thicker leather that you cant sew with a home sewing machine, you can always hand-stitch. yes, it’s tedious and long process and rarely anyone likes to do it, but In my opinion, it’s much better than speding many thousands of dollars for something that you don’t use daily. Most residential sewing machines will handle the leather thickness of 3/16” or 4-6mm. What Are the Prices of the Best Leather Sewing Machines? I`ll be honest, If you want a machine that will last for a long time, not jam and just overall won’t make pull your hair out, expect to pay around $500. You could get away with a $250 standard sewing machine if you intend to sew thin leather for your projects, use proper needles and use tips you find here in this article. For that price, you will get decent enough entry-level sewing machine with limited features that will get the job done. Now, on the other hand, If you’re serious about leather sewing, you will need a serious machine. If you intend to sew thicker leather, you will need a heavy duty sewing machine with good amount of features and high durability. For these kinds of sewing machines, expect to pay around $500 for a decent quality machine. If you’re looking for something high end, you will pay up to $1500 and more (Did someone say sugar daddy?) You will pay even more if you dont buy online, because local dealerships will upcharge up to 20% or more. Janome HD3000 heavy duty sewing machine can sew through multiple layers of fabric, denim, and leather with ease. Don’t let the hard plastic housing fool you. This sewing machine packs a serious punch. It’s even possible to sew through 6 layers of cotton. Just imagine having a sewing machine that does everything you want it to do and more. My favorite thing about this sewing machine is that it makes sewing feel like you’re cutting through butter. Not only that, but the result you get with this sewing machine will be consistent and professional looking. As with all leather sewing projects, make sure you have a hard and sharp needle. One wrong stitch and the material is ruined. Remember, once you punch a hole in leather, it’s permanent. Janome HD3000 have enough of sewing space for you to not have cramped up experience and sew comfortably which in turn will result in a good end-result. Heavy enough to not move around on the table, Light enough to take around with you. If you’re looking for a sewing machine for leather, Janome HD3000 is a perfect candidate as it’s heavy duty and made for the job. Under $200, Singer 4432 is excellent at sewing leather and other materials, even multiple layers of fabric for that price point. This is a sturdy machine with a metal frame, a heavy-duty electric motor so sewing light leather projects will be easy and fast. If you are a beginner, on a budget, but want a durable sewing machine that can make beautiful and consistent stitches, this is the one for you. Automatic threader makes threading the machine a breeze. One step buttonhole maker, creating buttonholes is easy as it gets. Singer 4432 sewing machine is perfect for someone who is on a budget but still wants to get into sewing leather. Great for beginner type of person out there.